Suddenly I Like Boots. Strange. I think that I will choose the blue short boots or…any of them! For several years…maybe even a lot of years…I wore clogs. You know those shoes that look normal at the front, but have no back. I had to learn to walk in them. Why would anyone in their right mind want to wear shoes that have a learning curve? What a curiosity! What an oddity! What a conundrum! Yes…what a puzzling situation! Even though puzzling, I started thinking that clogs were sort of attractive. OK…maybe, they were just casual and comfortable. If I could have always stayed upright in them, I would have been totally comfortable. When your foot slips off the back of the clog, there is not much you can do but fall down. Well…that was my own personal experience. The clog became rather dangerous and the falls were less than comfortable. And certainly the falls were not graceful. And Then I Discovered The Short Boot! Like Successfully Panning For Gold In Colorado! While shopping for who knows what, just shopping for something…I hear some short black boots calling my name. Evidently… these boots are correctly called booties. But..what does a clog girl really know about boots? I tried them on and guess what?!?! They felt great. They fit. They made me walk a little straighter. They made me feel taller. I realize that the last statement is a stretch. Just let me be naive for a little longer! Love the color…love the heel height! Different style and I really like them…even with the biker look! But…Don’t Count On The Snow At All!!! Two years ago this evening, our daughter walked down the very long aisle of our church. A smile on her face. Her groom waiting at the front of the church. A side glance here and there to see all of their friends, all of their relatives, all of their parents’ friends…gathered together from near and far. Surrounded by close friends and our daughter’s much loved “little cousins”, the photos to capture the memories were carefully taken. As her parents, we were filled with joy over this moment in time. Music and friends filled the reception with the fullness of happiness and laughter. The band played on and on. My husband welcomed our guests. There were a few tears from both of us. The groom danced with his mother. The bride danced with her father. Our close friend had known the bride since she was born. He gave a truly heartfelt prayer. The dinner and the party began. Fun and friends! The Owl. The Tree. The Sounds. Mr. Owl in a tree at our farm today. You may have to turn your volume up…he is rather quiet and shy…especially in the daytime with a camera in his face. Owls are a bit of a different creature. They are very busy at night and very quiet in the day. Owls can make quite a lot of noise if you happen to be visiting out in the country. Just what animals are the owls calling to and what are they saying? Owls worry the bald eagles with little eaglets in a nest because of the way they can easily and silently swoop down. They either scare away or bring the coyotes closer to a tree. The curiosity of an owl’s hooting can push a coyote’s curiosity to the max. Eventually, the coyotes will flee from the owl. Or so people say out in the country. An owl can easily push my curiosity too. I have always been totally fascinated by owls. They are just sort of unusually weird…well, in a good sort of way. It is true. We all have some weird trait that only someone with the same weird trait can understand. Finding the specific someone who has that trait can be a complex endeavor. And maybe it is not always a positive endeavor. According to Dr. Seuss, weird ones should join up with other weird ones and call it love. Not sure about that. I just know that I truly love owls and I am fascinated by their sounds in the night. Therefore…according to Dr. Seuss…I must be weird like the owl. Mutual weirdness. News flash for Dr. Seuss: my husband is not weird at all. He is really quite calm and normal. Just one weird person around here! Mr. Owl minding his own business and just sitting in the tree. I acquired Mr. Owl when my husband found him for sale in the Halloween aisle of a nearby “we have everything you need and some things that you didn’t know that you really need” type store. I had no idea that I needed Mr. Owl, but I was so excited to own him. This is the very important “Mr. Owl” that your husband would like! We might could work out a trade or just a “husband’s junk store find” visitation schedule! I honestly and desperately need your “Pete the Pirate”! Mr. Owl became a permanent resident in my classroom. I was teaching Third Grade when he arrived and every grade down to Kindergarten and Pre-Kindergaten during his residency. Every child…no matter what age…were very fascinated by our pet owl! Did I mention that he was very fake, but very close to being real to the children?! Each year, Mr. Owl was the catalyst for many exciting classroom science lessons. Our owl study was very similar to the weeks and weeks that we studied the Bald Eagles in Decorah, Iowa. Please see my August 24th post titled Learning About Eagles. Amazing!…the children always left for summer vacation with a love of learning about eagles and owls and science! And they learned lots of facts and so did I! Such a fun classroom time! 1. There are around 200 different owl species. 2. Owls are active at night (noctornal). 3. A group of owls is called a parliament. 4. Most owls hunt insects, small mammals and other birds. 5. Some owl species hunt fish. 6. Owls have powerful talons (claws) which help them catch and kill prey. 7. Owls have large eyes and a flat face. 9. Owls are farsighted, meaning they can’t see things close to their eyes clearly. 10. Owls are virtually silent in flight compared to other birds of prey. 11. The color of owl’s feathers helps them blend into their environment (camouflage). 12. Barn owls can be recognized by their heart shaped face. As we studied owls, Mr. Owl stayed quietly in his place on a shelf at the front of my classroom. For most of the years, he remained silent unless someone punched the small “sound” button attached to his right talon. It was a rule that Mr. Owl did not want to be touched, so this rarely happened. He was quiet UNTIL THIS YEAR! During our circle time when I was teaching a lesson or reading a book to the children, Mr. Owl would suddenly start hooting! All of the children would be sitting on the floor in front of me. He was obviously getting tired of his perch! Which owl is real? See the story and picture in The Huffington Post. Mr. Owl was also ready to retire! He now lives at our farm. He did make a suddenly very loud appearance during Thanksgiving! Sometimes Mr. Owl cannot keep quiet! And then he decided to quietly flee away! For at least 10 years, I made Oatmeal Scotchie Cookies at Christmas. And then I forgot about them. Some other new cookie recipe came along and took their place. Oatmeal Scotchie Cookies were missing at our house for several years. I realize that there is absolutely nothing about these cookies that look a bit like Christmas. If you give them away as a gift, you have to make sure to choose a really special holiday container! You might help the situation by adding some Hershey Chocolate Kisses in the container! By the time the cookies have disappeared, your friends won’t care if they looked like Christmas treats at all. These cookies are that good and that easy! I found the recipe a long time ago when Nestle Butterscotch Morsels first hit the grocery store shelves. It was on the back of the package and the recipe is still located on the back of the package. Still, Oatmeal Scotchie Cookies are just not as popular as the venerable Chocolate Chip Cookies. However, they are very popular with my family and every friend who has tried them. I made Oatmeal Scotchies one Christmas for every employee at my husband’s office. That took way too long…especially after the search for pretty ribbon wrapped containers. But, it was a fun “way too long” time! Everyone likes special attention! When I was teaching, I was always totally thrilled with homemade presents! Last year, I received two dozen delicious tamales! I was able to share them with my family, but I did have a couple of tamales on the long drive home from school! Messy, but great! No doubt, your friends will be just as impressed with Oatmeal Scotchies! I will admit that it is mighty difficult to compete with the two dozen tamales! Combine flour, baking soda, salt and cinnamon in small bowl. Beat butter, granulated sugar, brown sugar, eggs and vanilla extract in large mixer bowl. Gradually beat in flour mixture. Stir in oats and morsels. Drop by rounded teaspoonful onto ungreased baking sheets. Bake for 7 to 8 minutes for chewy cookies or 9 to 10 minutes for crispy cookies. Cool on baking sheets for 2 minutes. Remove to wire rack to cool completely. Blowin’ in the Wind is a mesmerizing picture book for all generations…for all ages…for children…for grownups. Bob Dylan’s message of hope amid discord still resonates today. Perhaps the words to the song resonate even more strongly today. 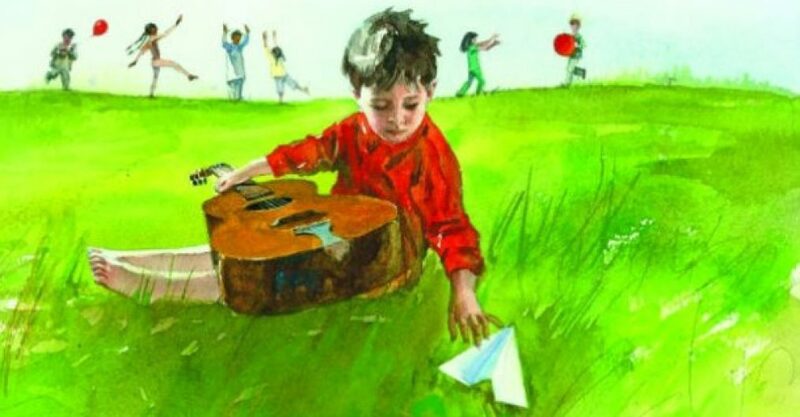 Dylan’s word are beautifully illustrated by John J. Muth, a Caldecott honored artist. A CD of Dylan’s original 1963 recording of Blowin’ in the Wind is included with the book. I happened upon the book in Barnes & Noble about five years ago. In 1963, my older brother liked folk music and played this song over and over on his “record player”. He played the song so much that I soon had it memorized, although I was too young to truly understand the deep meaning of the haunting lyrics. As time went on, I realized that Blowin’ in the Wind was known as an anthem for the civil rights movement. There were protests and not all were peaceful. The lyrics to the song also reflect the serious questions that we still have regarding war, peace, justice for all, personal freedom, and freedom of speech. “for having created new poetic expressions within the great American song tradition”. Construct a Kid’s Barrel Train! What could be more fun for a child than riding a Barrel Train…especially one that was constructed at home!! The first time that I saw a Barrel Train was at our Family and Friends Thanksgiving Celebration about four years ago. Evidently, everyone else was more with the program than me…they not only knew about making the trains, but they had seen them at fairs and other events. I suppose this is what happens when your children are suddenly grown up and the kiddie rides no longer hold the same interest! When I saw the Barrel Train being carefully unloaded from a trailer at Thanksgiving, I instantly wanted and needed one…for our future grandchildren, of course! This train was just too exciting for words. Far more exciting than the chocolate pies waiting inside the house. All of the children rode the train off and on the entire day. First, someone had to volunteer to drive the four wheeler to pull it and someone else was needed to be the “crowd control” person. Barrel trains can also be pulled by small tractors and golf carts. I didn’t offer my own golf cart… the trails and bumps and hills have left it with a distinct lack of power! After searching on the internet, I found many sites devoted to DIY people ready to make a Barrel Train. The following is a YouTube video that explains (easily…?? )how to construct a kid’s Barrel Train! Have fun and I hope you are far more handy than me!